The best-of-seven Doyle Cup series starts Friday night in Wenatchee as the BCHL’s Wild takes on the AJHL’s Spruce Grove Saints. Winning the series means a berth in the RBC Cup national championship which happens May 12 to 20 in Chilliwack. NHL prospects: The latest NHL Central Scouting rankings included four players that will compete in the Doyle Cup. Wenatchee Wild defenceman Slava Demin was the highest-rated player, listed at No. 40 among North American skaters. Spruce Grove defenceman Sean Comrie was next highest at No. 108. Wenatchee forwards Jasper Weatherby (No. 198) and Sam Morton (No. 212) were also listed by Central Scouting. 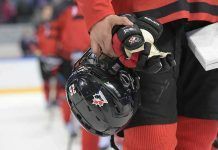 College hockey commitments: There are 20 players in the Doyle Cup committed to programs for future seasons. 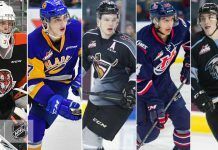 The Saints have eight players committed to college and university programs for next season while the Wild have 12. Future teammates: There are eight players in the series that should be teammates in NCAA Div. I hockey in future seasons. The Saints’ Jordan Biro and Sean Comrie are committed to the University of Denver, as is Wenatchee’s Slava Demin. Saints forward Chase Olsen is committed to Merrimack College as is Wenatchee’s August Von Ungern. 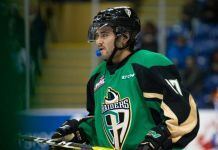 Spruce Grove leading scorer Chris Van Os-Shaw will suit up alongside the Wild’s Zak Galambos and Lucas Sowder at Minnesota State. Coaching ranks: Spruce Grove bench boss Bram Stephen is in his first season at the helm for the Saints after spending five seasons in the Alberta College Athletic Conference coaching Grant MacEwan University Griffins. He gained AJHL coaching experience as an assistant for two seasons with the Drayton Valley Thunder prior to coaching Grant MacEwan. Wenatchee Wild head coach Bliss Littler is the winningest coach in American Junior hockey history. His career began in Billings, Montana in the now defunct AFHL before he made three stops over 10 seasons in the USHL with Topeka, Tri-City and Omaha. Littler came to Wenatchee in 2012 when the club was in the NAHL. He has been the BCHL coach of the year the last two seasons. Hardware: Spruce Grove’s Chris Van Os-Shaw was named the AJHL MVP after a season where he posted 51-46-97 in 59 games. He was also the league’s top scorer by 17 points. Wenatchee’s Jasper Weatherby took home BCHL MVP and top-scorer trophies after posting 37-37-74 while playing all 58 games. 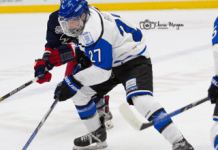 Cooper Zech was named the BCHL’s Top Defenceman after posting 11-59-69 in 58 games. Bliss Littler was named Coach of the Year for the second-straight season.